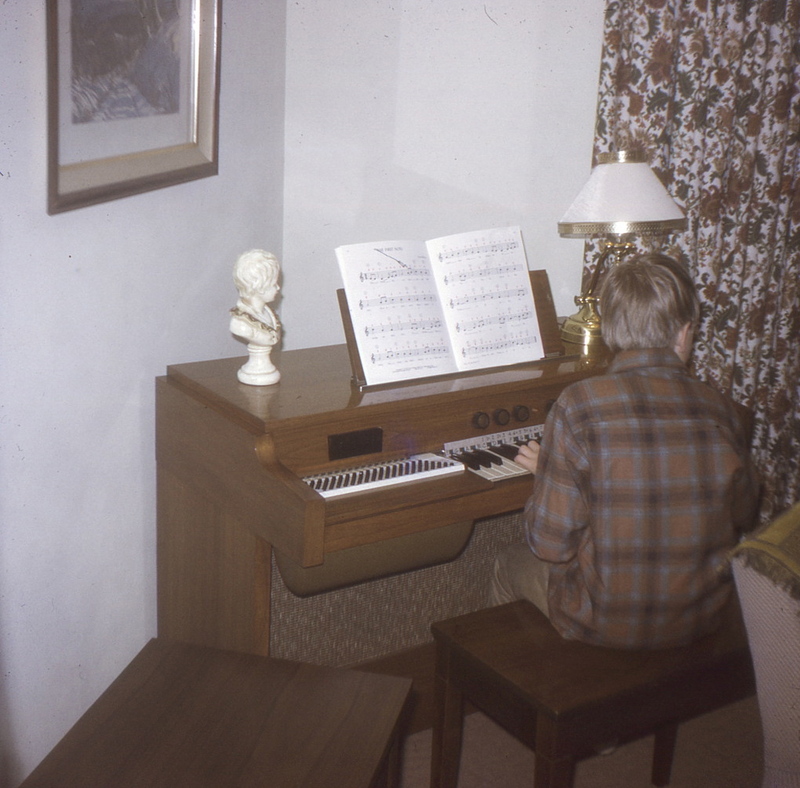 Sunday, June 5, 1977, I played piano for morning service at Bethel Methodist Church in Mound, Minnesota. The diary doesn’t relate how I got that gig, but I suspect Pastor McClelland approached the folks with the request after he’d heard I harbored some musical talent. I was allowed to play two other songs of my choosing before the Doxology, so I picked Yes’ “Soon Oh Soon” from Relayer and The Moody Blues’ “You Can Never Go Home” from their LP Every Good Boy Deserves Favour. The latter seems to have gone off well, but the former not so good. And the Doxology? Oops. The piano and I go back a long way. Don’t recall my first piano; neither set of grandparents were musical, so it was likely not at their homes. The picture above is of me at someone’s organ, around the age of 13. It may be at Grandpa and Grandma Adams’, but I can’t verify that given the drapes or corner of the room. To my memory, Grandpa’s chair was always in that corner. Last time I played piano was May 2008, on a Czechoslovakian-made baby grand in my ex-girlfriend’s Armenian church in St. Paul. 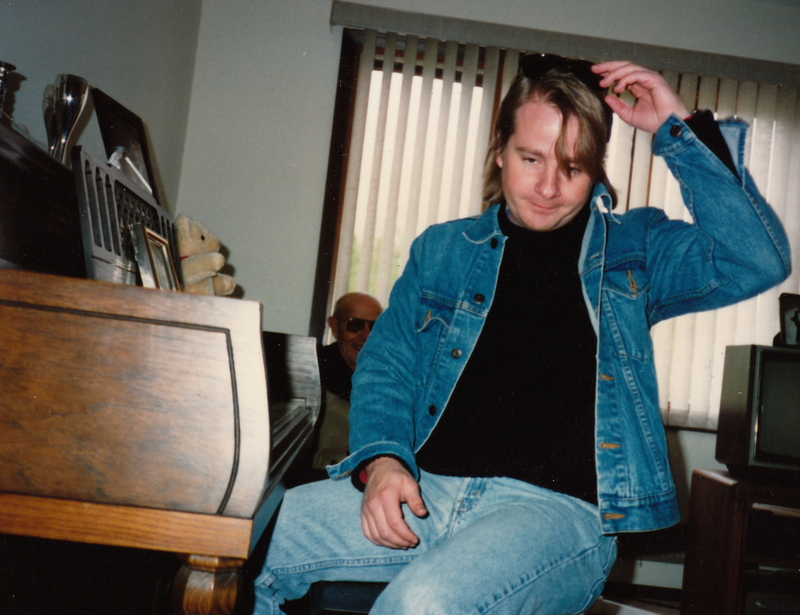 Probably attempted the obligatory few bars of “Lady Madonna.” The photo below is from the late ‘80s at my brother’s house, playing something for Grandpa Maupin, who’s directly behind me. Seem to recall a whiff of exasperation from Mr. Standen. I soon discovered Gary Brooker of Procol Harum, Elton John from church friend Loren’s amazing ability at replicating John-Taupin songs, and all the attention that garnered Loren in the form of girls swooning over love songs. But learning others’ songs was one thing. I was all about improvisation. I spent many hours losing myself in songs I will never remember nor hear again, as they weren’t recorded. For example, on June 14, I took Mom’s car out for a spin and stopped at the Minnetonka Arts Center’s east annex, a renovated old schoolhouse with a grand piano upstairs in a spacious, mirrored hardwood floor loft. If a dance class wasn’t in session, I’d sit and play to my heart’s content. If anyone asked if I belonged there, I’d say I was a student of Mr. Standen’s. Most of the time I was left alone. When Mom sold our upright piano for an organ, I was disappointed. It just wasn’t the same thing getting the sound I loved out of an organ—the percussive effect of keyboards. While it’s been awhile since I played piano, I still get the same feeling banging on the keyboard—of my word processor. ~ by completelyinthedark on March 25, 2012.